LAWRENCE - Joanne M. (Pizzano) Wills, 99 years, of Lawrence, formerly a longtime resident of Beverly, passed away Tuesday morning, November 20, 2018 at the Berkeley Nursing Center in Lawrence. Born in Beverly, daughter of the late John and Nicoletta (Pia) Pizzano. She was raised and educated in Beverly and was a graduate of Beverly High School. Joanne had been employed as a technician for the Western Electric Company in North Andover for nineteen years prior to her employment at the General Electric Company in Lynn. While employed at Western Electric she was a member of the Pioneer Club. Following her retirement, Ms. Wills had volunteered at Beverly Hospital and the North Shore Music Theatre in Beverly for many years. She is survived by one daughter, Sharon D. Smith of Andover; one son, Robert R. Wills and his wife Anne G. of Natick; grandchildren, Lindsey and her husband, Greg Wassey, Erin, Victoria and her husband, James Rufo, and great grandchildren, Taylor, Gabrielle and Camden. She was the sister of the late Mary Risoldi and Angelo Pizzano. 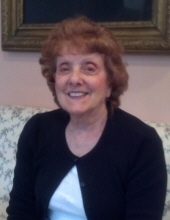 Her Graveside Service will be held at St. Mary’s Cemetery, Brimbal Avenue, Beverly on Tuesday, November 27 at 1:00 PM. Relatives and friends are invited to attend. In lieu of flowers, donations in Joanne’s name may be made to MSPCA. Arrangement by the Campbell Funeral Home, 525 Cabot Street, Beverly. Information, directions, condolences at www.campbellfuneral.com. To send flowers or a remembrance gift to the family of Joanne M. Wills, please visit our Tribute Store. "Email Address" would like to share the life celebration of Joanne M. Wills. Click on the "link" to go to share a favorite memory or leave a condolence message for the family.